During the year, my grandma would buy radishes and add the radish leaves to her salad. Because there weren’t too many radish leaves, we kids would fight over them. That’s why Grandma would buy a lot of radishes during the Christmas holidays and make this radish salad. As you can see from the photo, it is very easy to make. Just wash the radish leaves and place them out on a serving platter. Top them with the sliced radishes and maybe sliced olives or a roasted pepper. Drizzle with olive oil, red wine vinegar, salt and pepper. South Jersey looks a lot like rural North Carolina farm country. I know it’s not, though, because instead of shack-like stores on the side of the two-lane roads selling barbecue, they sell ravioli. Instead of large crosses and “Thank you, Jesus” signs, there are monuments to Padre Pio. It is otherworldly to me, a parallel universe where the Italians took over the Heartland of America. I mean, what says it more than the Sacred Heart of Jesus and a John Deere? Hammonton, New Jersey, was settled by Italian immigrants during the American Civil War. The community was started by one Sicilian immigrant who encouraged others to come. They did, establishing farms, and their descendants now grow Jersey’s famed tomatoes, blueberries and peaches. Each July, Hammonton also hosts the longest running Italian festival in the U.S., the Our Lady of Mount Carmel festival that celebrates the feast day of Our Lady of Mount Carmel on July 16. In its 143rd year, the festival runs from July 9-16. There’s plenty of Italian food, and this is probably the one place in America where you can get broccoli rabe added to your sandwich. The highlight for me is the procession of the statues in front of Saint Joseph’s Church. If you donate a dollar, you get a prayer card of the saint that is passing by. If you travel to the area, don’t forget to visit Penza’s Pies for blueberry pie or Bagliani’s Italian Market for Italian products. Forlini’s has been serving Italian food since 1943. It is on Baxter Street below Canal in Chinatown. What newcomers to New York may not realize is that Little Italy used to be much larger, and there are remnants of it sprinkled throughout Soho, Nolita, Little Italy and Chinatown. (The houses my family moved to from Italy are on the part of Mulberry Street in Chinatown.) The restaurant’s menu says it serves Northern Italian cuisine, but it has a lot of Southern Italian cuisine as well. In addition to being a classic Italian restaurant, it is also a classic New York restaurant and a must for anyone wanting some NY nostalgia. Don’t forget to enter the GIVEAWAY in celebration of my 1000th post! I thought it would be appropriate to post this the day after Thanksgiving when everyone has an upset stomach. When Italians have an upset stomach, they call it agita. If one has agita, there is only one remedy for it–Brioschi, pronounced bree-uhsh-ki. (The bottle says Bree-os-kee, but my family pronounces sch like “shk” not “sk.”) When I was a kid, if my grandmother had agita, she’d take out that familiar fat blue bottle with the large red lettering. She’d sprinkle some strands of Brioschi onto a napkin for me. I’d eat it like it was a fizzy lemon candy. It is an effervescent antacid and you were supposed to add it to water like Alka Seltzer. But we would just eat it. Brioschi is over 100 years old, and the company that made it went into real estate and sold the business to an American company, Brioschi Pharmaceuticals, LLC. Last I saw, it was still being produced. However, one bottle is being sold online for $44-$199, so I’m thinking maybe the company is not selling it anymore. And the company website is offline and the Twitter hasn’t been updated in a year. 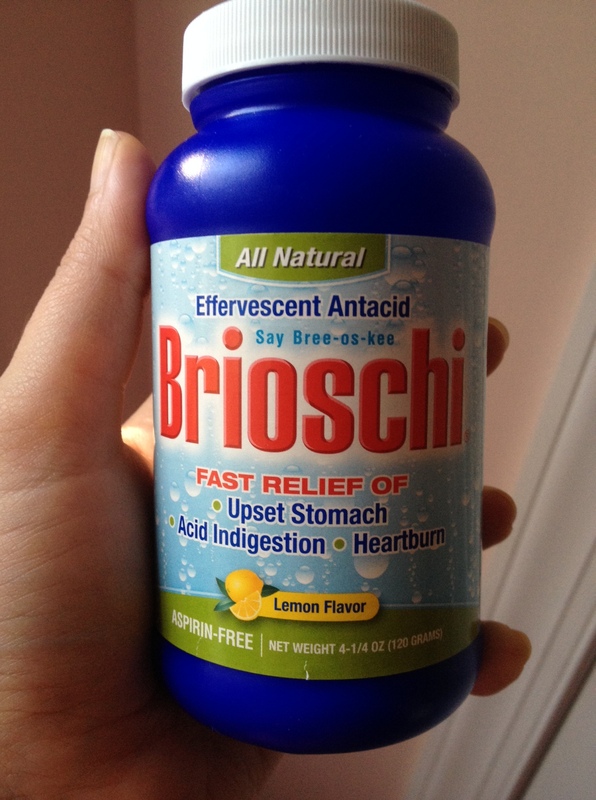 I really hope they can continue to sell Brioschi because not only is it a product of nostalgia, it is also the most effective antacid my family has ever used. I love old world bakeries. Whenever I visit a new city, I always look for old bakeries. I don’t care if they look dirty or grungy from the outside, or if they have outdated signs out front. Those signs are a sure “sign” that deliciousness awaits me inside. I feel good that I am supporting a family and the local economy as well as eating something that was made with pride and craft. So if you are visiting NYC or if you live here, when you eat at most of the bakeries on this list, you are supporting local families and businesses that represent the history and culture of this diverse city. I’ve written about Italian bakeries in Manhattan before in Dina’s Guide to NYC Italian Bakeries. My favorite bakeries are old school and traditional German, Jewish and Italian ones. There is only one German bakery and only one Jewish bakery left in Manhattan. (As far as I know–please tell me if there are more. There are other places to get German and Jewish baked goods, ex. Zabar’s, but not other old school bakeries. East Broadway Kosher on Grand near Kossar’s closed, but I’m not sure if it reopened? Last time I was there, it was closed.) In this list I’m including bakeries that have sweet bakery items. Following that is a list of specialty old world bakeries that make bread, knishes, bialys etc. Many of these places are cash only, so go prepared. Moishe’s—Lower East Side, Grand Street at East Broadway, and East Village, 2nd Avenue at 7th Street, Moishe’s is my favorite bakery in the city–the quintessential bakery. I am addicted to Moishe’s. The best hamentaschen, the best black and white cookies, the best rainbow cookies. I’ve never had anything here that wasn’t delicious. It’s no frills with graffiti on the window, but who cares? I’m here for the cookies, not the decor. They do have a new sign out front, but I’m keeping this photo of the old one. I’ve sung the praises of Moishe’s many times. Poseidon—Hell’s Kitchen, 9th Avenue between 44th and 45th Streets, At 90 years old, Poseidon is still family owned and the only Greek bakery in Manhattan, and one of the last businesses in what used to be a Greek neighborhood. 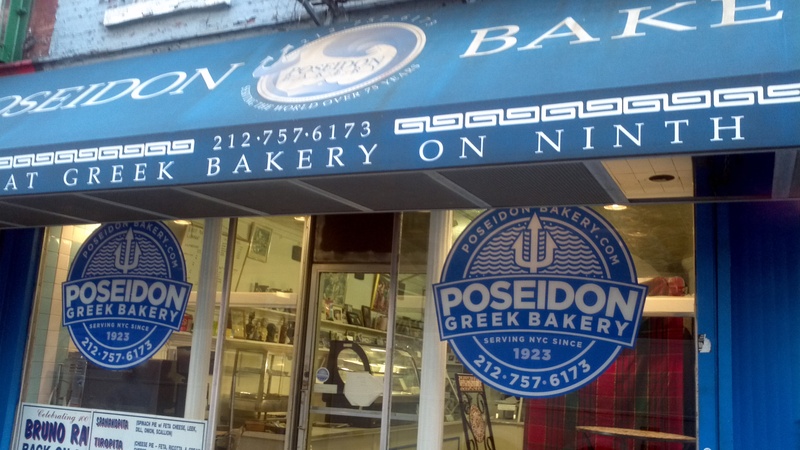 Here, you can get delicious Greek goodies like baklava and cookies. The handmade phyllo dough strudels are a must-get. I’ve written about Poseidon before. 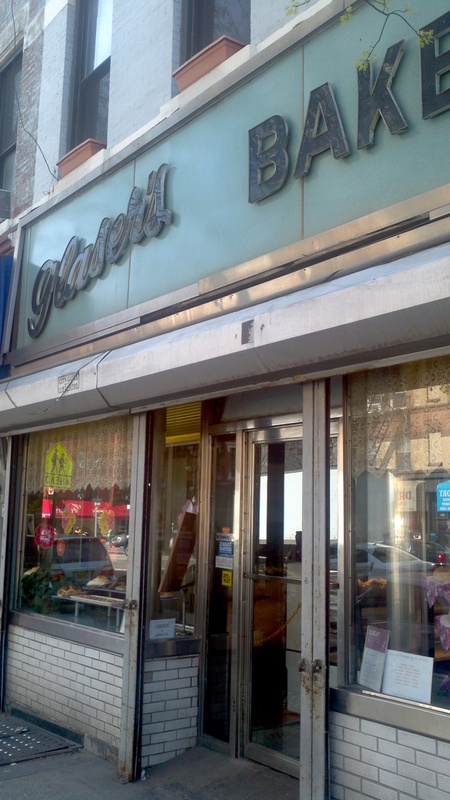 Glaser’s Bake Shop—Yorkville, Upper East Side, 1st Avenue at 87th Street, Family-owned since 1902, Glaser’s is the only German bakery in Manhattan in what used to be a German neighborhood. It still turns out amazing crumb cake, jelly doughnuts and danishes. However, it also makes American favorites like brownies too. This is an old school bakery at its best. Check out the beautiful wood interior and tile floor. I’ve written about Glaser’s before. La Delice—Kips Bay, 3rd Avenue at 27th Street, La Delice is an old school bakery with a variety of classic baked goods and beautiful cakes. They have many colorful macarons. Andre’s Hungarian—Midtown East, 1st Avenue at 57th Street and Upper East Side, 2nd Avenue at 85th Street, Andre’s is the place to go for traditional, handmade strudel and other Hungarian pastries and gorgeous cakes. Ferrara—Little Italy, Grand Street at Mulberry, Ferrara, a legendary Italian pastry shop, opened in 1892 by Enrico Scoppa and Antonio Ferrara. 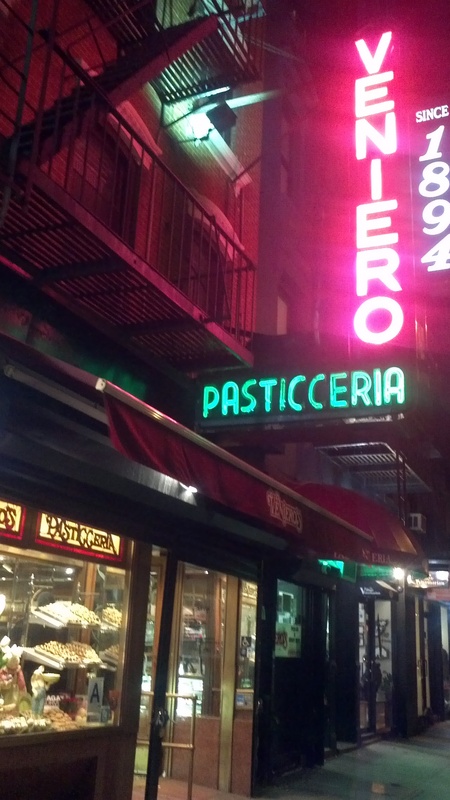 The fifth-generation pastry shop gained fame when Enrico Caruso became a regular. 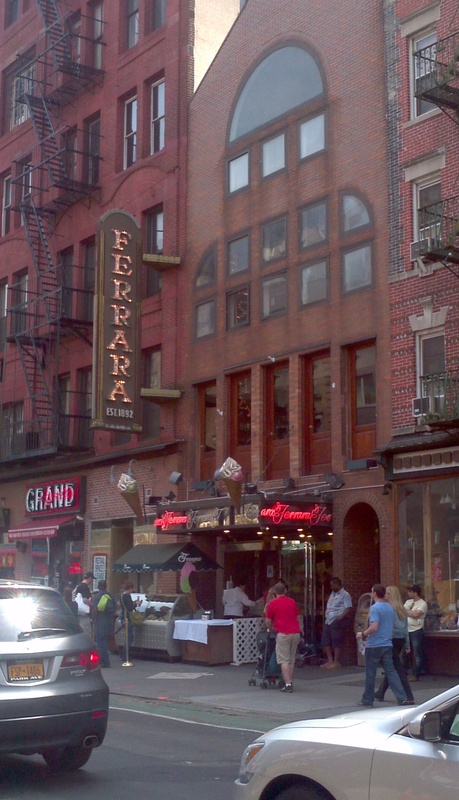 Ferrara’s became well-known for its cannoli and torrone. Talk about being a kid in a candy store. I take one look at the glass case of glistening glazed fruit atop an array of pastries in a myriad of colors, and I’m mesmerized. 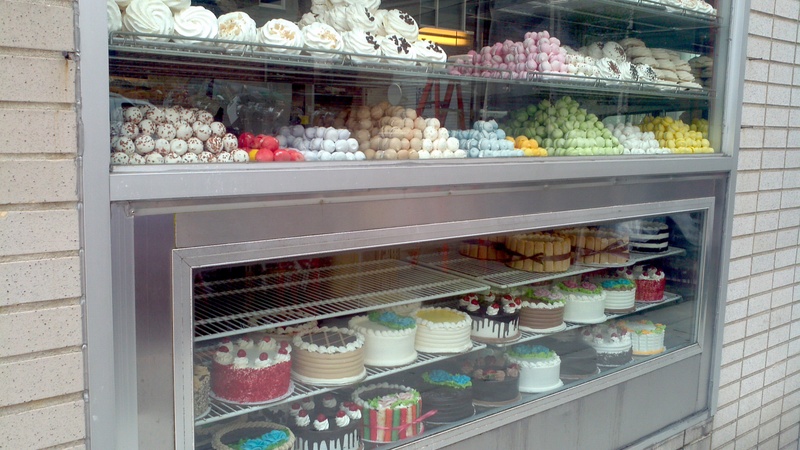 The pastry case at Ferrara’s is a work of art. 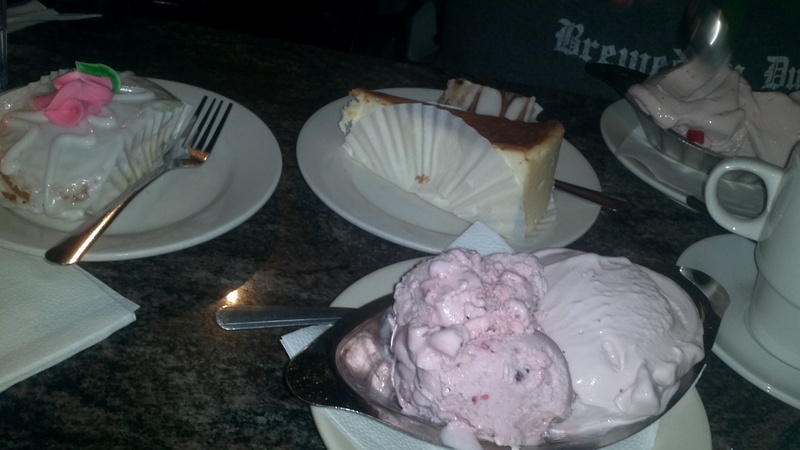 When I talk to people who’ve never been to an Italian bakery, I show them pictures of Ferrara’s. Everyone in my family will attest to Ferrara’s being the gold standard of New York Italian pastries. La Bella Ferrara—Little Italy, Mulberry Street at Canal, is an old school bakery. Walk in here and the waft of fresh-baked cookies fills the air. Many are displayed in the usual bakery case but there’s also a table of cookies that reminds me of the dessert table at a family party. Veniero’s—East Village, East 11th Street at 1st Avenue, Veniero’s claims to be America’s oldest pastry shop, opening in 1894. Veniero’s is also owned by Bruce Springsteen’s cousin. 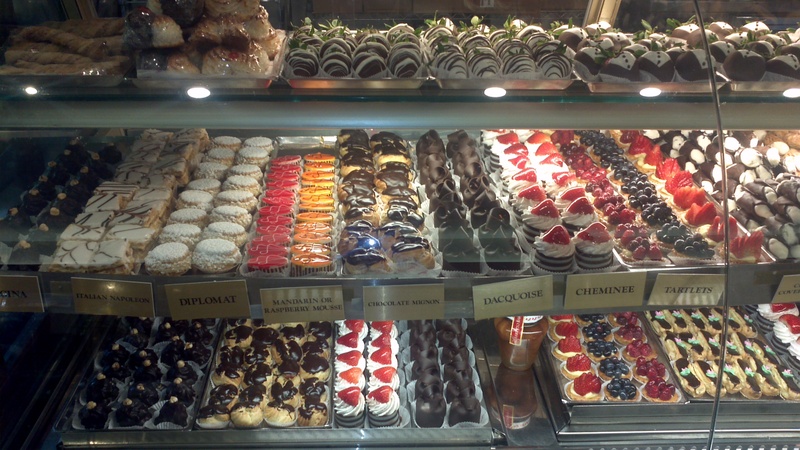 It has a beautiful display of traditional Italian pastries as well as a cafe. William Greenberg Desserts—Upper East Side, Madison Avenue at 82nd Street, Rugelach, black and whites, hamentaschen, rainbow cookies and Linzers…need I say more? Oh yeah, how about black and whites in custom colors? 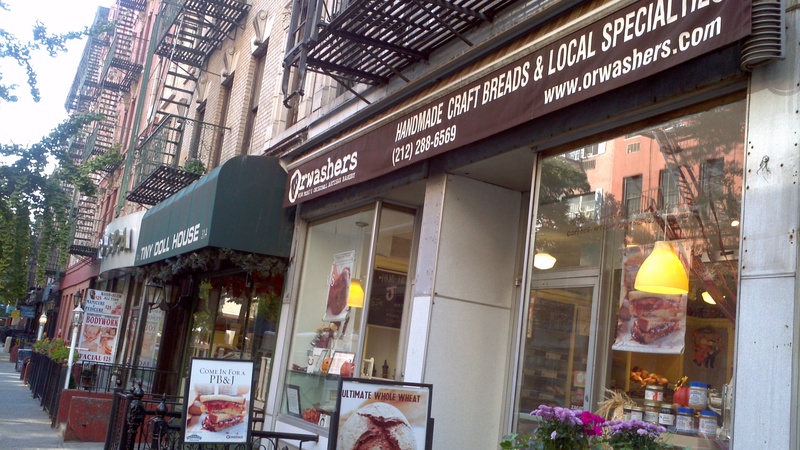 Orwasher’s, Upper East Side, 78th Street at 2nd Avenue, Orwasher’s opened in 1916 and was known for its Eastern European-style bread. The bakery got a new owner in 2007 who added other European artisanal breads, and there are still the same wonderful pastries. Did I mention fill-to-order jelly doughnuts and the sweetest staff in NYC? Fay Da—various locations, While I’m not an expert in Chinese baked goods, I’ve been to many bakeries in Chinatown. Fay Da is my favorite with consistently fresh and tasty pastries. Russ & Daughters—Lower East Side, Houston Street at Orchard Street, Celebrating 100 years this year, Russ & Daughters is a classic NYC institution. It is in this category because it specializes in smoked fish and also has baked goods like babka, rugelach and macaroons. But it also serves a bit of feminist history. As the original owner had no sons, he left his shop to his daughters, hence the name. Kossar’s—Lower East Side, Grand Street at Essex Street, Kossar’s specializes in bialys. Yonah Schimmel—Lower East Side, Houston Street between 1st and 2nd Avenues, Yonah Schimmel has specialized in knishes for over 100 years. Parisi Bakery—Little Italy, two locations at Elizabeth and Mott Streets, Family-owned for over 100 years, Parisi Bakery specializes in bread and deli sandwiches.